Mountain air has a way of working up an appetite. Whistler’s bounty of fresh and fun dining options will sate even the most frugal adventurer. Eat your way through Whistler’s summer season with this list of deliciously affordable eats. When I found out the Farmers’ Market was going to take place on Sundays and Wednesdays through the summer, I did the happy dance. 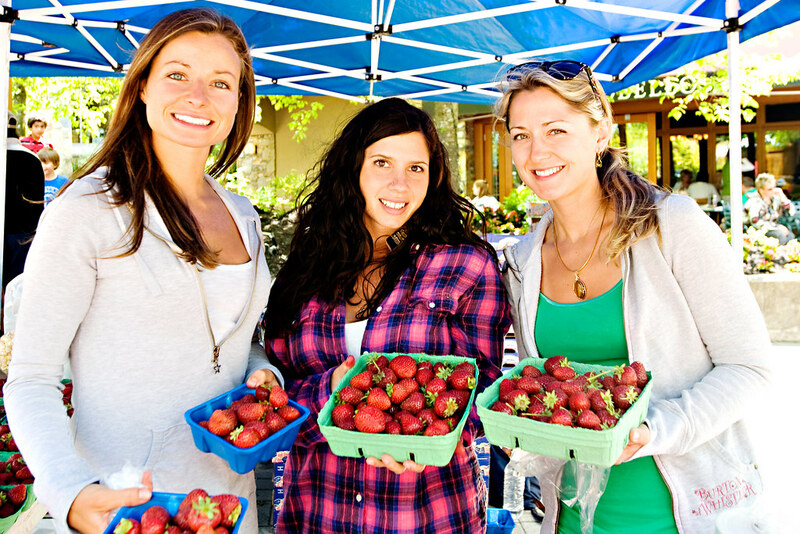 Located in Whistler’s Upper Village at the base of Blackcomb Mountain, you’ll find the stroll between the Fairmont Chateau Whistler and Glacier Lodge jam-packed with kiosks offering farm fresh fruit and produce, baked goodies and delicious artisan treats. Bring cash! Karsten at the Maluma Bison kiosk serves up free range bison sausages smothered in homemade onion relish and authentic German sauerkraut on a crusty bun so you can munch while you stroll. I also love grabbing a crusty loaf of bread from Purebread Whistler – my fave is the Tortano, a loaf made with roasted potato and honey – and stocking up on organic cheese, sun warmed tomatoes, fresh raspberries and gooey, just-baked cinnamon buns before heading to Lost Lake for a picnic. Who knew Whistler’s Visitor Information Centre housed one of the village’s best sushi take-out joints? Now you do. This little food stand tucked within the Info Centre is rolling out some of the freshest, tastiest sushi in Whistler. The Alaskan roll, chock full of fresh salmon and avocado, is fabulous. Unexpectedly, the de luxe Fairmont Chateau Whistler offers some of the best value in Whistler for foodlovers. This grand hotel located in Whistler’s Upper Village is home to Fairmont Fridays, the perfect way to end the week. The Mallard Lounge and the sunny terrace rocks with live music (often featuring a very talented Aussie named Colin Bullock and a signature cocktail or a frosty pint of Whistler Beer for just $5. A selection of appetizers like duck springrolls and potstickers, or BBQ pulled beef sliders and onion rings are available for $5. You can also take advantage of 50 per cent off everything on the menu in the Wildflower Restaurant from 5pm to 6pm any day of the week through the summer. Snow isn’t the only cool thing about Whistler…locally made Lucia Gelato’s creamy creations are just the ticket on a hot summer day. 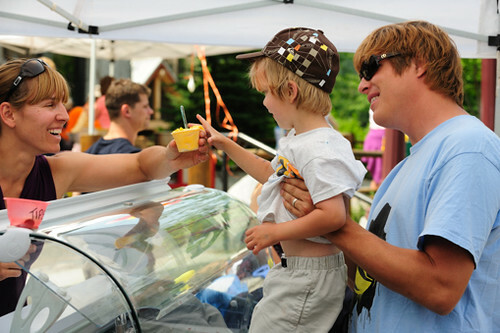 Concoctions like Chocolate Hazelnut Kiss and Coconut Joe are made in the “old fashioned artisan manner” and are available at the blue tent outside Merlin’s at the base of Blackcomb Mountain. Or enjoy glacier gazing with your gelato at the exit of the PEAK 2 PEAK Gondola on Blackcomb Mountain. Lucia’s Gelato is the star of many Whistler restaurant dessert menus and is available in 500ml tubs in Whistler grocery stores. Gone Bakery is tucked behind the Grocery Store in Village Square and is a favourite with locals for their house made soups, sandwiches and tasty baked treats. Soups and stews ranging from Thai Chicken to French Onion are served up with a chunk of fresh bread – my fave is the Jalepeno Cheddar. Armchair Books is next door, so if you have a rainy day on your hands, hit Gone with a new book (try local author Leslie Anthony’s White Planet) and finish off that hearty lunch with a gluten free raspberry chocolate chip muffin. Free wifi is available so feel free to post envy-inspiring Tweets and Facebook updates. Splitz Grill is a gourmet burger joint located in the north end of the village on Main Street. I love this place for their huge, juicy burgers and for their garnish bar where you make that burger your own work of meaty art. The spicy lentil burger, grilled chicken, seasoned all beef, free-range buffalo, and BC turkey burgers take care of any epic burger cravings. Oh, and the fries. Fat fingers of potato perfection…don’t even get me started. Creekbread is a warm and funky pizzeria located in Creekside. I am not normally a fan of pizza but these wood-fired, organic flatbreads transcend the usual offering. Creekbreads are made with fresh, organic ingredients and free-range, nitrate-free meats making for happy food served up in a happy place. One bite in and you’ll see why this place was voted Whistler’s Best Pizza in the Pique Newsmagazine’s definitive poll last December. No list of must-eats in Whistler would be complete without Zog’s. This food stand in the heart of Whistler Village doles out cheap and cheerful chow including bratwurst, beavertails and their infamous poutine, a delicious concoction of French fries and cheese curds swimming in beef gravy. A Quebecois staple, this decadent slop is best consumed in the wee hours of the morning while reveling in the night’s exploits with friends before staggering home to bed.